Cambridgeshire’s Police and Crime Commissioner Graham Bright has released details of how much he has spent running his office in his first year. The commissioner spent the astronomical sum of: £885,312.99 on his office between November 2012 and November 2013. This figure was not pro-actively released by the commissioner, but obtained via a Freedom of Information request I made. A breakdown of this figure is given and it appears to exclude salaries for the commissioner and his deputy. [See Monday 9 December update, in fact the salaries were included under a bizarre heading of "support staff"] The costs of these (including employers’ national insurance) are £108,000.00 taking the total to £993,312.99. A further £10,000/year is budgeted for the commissioner and deputy’s expenses, which if claimed would put the total cost for the commissioner’s operation at over a million pounds a year (£1,003,312.99). p42 of the Police Authority Accounts for 2011-12 (its last full year of operation) show its total expenditure, including members’ expenses and allowances, was £839,000.00. Of the £839,000.00 spent by the Police Authority £216,000.00 was spent on members’ expenses, allowances and other costs. Now we no longer have a Police Authority, and there are no members, this money should simply be being saved. Are Salaries and Costs for the Commissioner and Deputy Included in Released Spending Information? The only two categories of spending large enough to include the commissioner and deputy salary and national insurance costs are labelled “Hay Related Staff” and “Support Staff” respectively. If the commissioner’s salary is being obfuscated under such headings that would be surprising. The £82,240.22 spent on “Fixed Term Contract Staff” is not large enough for the Commissioner’s £70,000/year salary to be included within that as well as payments to the deputy. I hope that councillors, and or the professional press, will join me in trying to obtain clear information on the Police and Crime Commissioner’s spending. I am concerned that it appears the manner in which the Commissioner has released information is intended to obfuscate what is going on. It may be an active attempt to discredit those, like me, who comment on the unclear information while pursuing clarity. Given the commissioner has accidentally included substantial expenditure in his published spending data by mistake it may be there is confusion and a lack of clarity within his office, and not just in what he is releasing to the public. I have now sought explicit clarification from the commissioner as to what is included within the information released. I note my original request sought clarity and suggested a breakdown including ” Commissioner and Deputy (incl oncosts and expenses)”. The Police and Crime Commissioner publishes monthly spending data. As yet he has not released detailed expenses information. The spending data released in response to my FOI request includes lines which appear to be expenses for the Police and Crime Commissioner. There is £1742.14 worth of spending described as: “Police and Crime Commissioner – Car Allowances Staff”. I note there are other lines of expenditure described as “Office of the Police & Crime Commissioner – Car Allowances Staff” so it does appear the former relate specifically to the Commissioner rather than his staff. I also noted the Commissioner has paid £18,609.00 towards the 2013/14 cost of ACPO. Richard Taylor The MEP has just told me your two members of staff, the ones for engagement in Cambridge and Peterborough, will be on top of the staff currently employed by the Police Authority. Is that right? You are going to cost more, your office is going to be bigger, than the Police Authority’s? Graham Bright It’s going to be less. Deputy Commissioner Ashton assured his confirmation hearing that the commissioner’s office would cost less than the Police Authority cost. No rental costs for the Commissioner’s Cambourne office are included. In my Freedom of Information request I asked for details of the arrangement there (he could be using the facilities for free; he could be accruing a bill he hasn’t paid yet), but none were forthcoming. During a recent Home Affairs Select Committee session Warwickshire’s Police and Crime Commissioner reported he’d got rid of all the staff he’d inherited from his Police Authority and was planning to recruit just three. Warwickshire Police & Crime Cmmr tells @CommonsHomeAffs he has no staff in his office (but is recruiting 3). Massive contrast to Cambs. Ron Ball: There is an argument at the moment, Chairman, that I have zero staff in my office, in that the ones I inherited are no longer with me and I have just had 120 applications for three positions. We have whittled that down to 16 and I think it is four to one women to men of that 16. I will be interviewing on Friday and Monday of next week. What about the Finance Director he is advertising for via Reed Finance? Those costs are included in the office costs (along with those of all the other staff, contractors and consultants). Richard – I agree with you on the clarity issue. One can only take the view that the PCC does not want “nobodies” like you understanding too clearly what he does, and how he does it. You might tell someone. Having said that I think you will find that the PCC and Deputies costs are included in the figures you received. Description 1 gives you who is responsible for the expenditure, Description 2 gives nature of expenditure (?). So under PCC / support staff you get a figure of £108k which is what you expect. Presumably the costs of the CFO/ treasurer has been split across 2 headings. I think his are the consultant and treasurer fees. Expect these costs to go up after recruitment by Reed of a new CFO. One also presumes that Office costs will not be rduced by the employment of a Director of Communication and Public Engagement. Clearly the PCC is recruiting someone to more effectively dismiss your comments and spin the great value that the PCC provides whilst failing to hold the police accountable for anything – given that anything beyond targeting a few cyclists is an “operational matter”. It should not be necessary for you to put in an FOI request for such basic information from a democratically elected body. Yes, as well as the ACPO subscription Police & Crime Commissioner Graham Bright has spent £19,750.00 of the taxpayer’s money under his control on a subscription to the Association of Police and Crime Commissioners. His decisions to make each of those payments have not been submitted by the commissioner to the Police and Crime Panel for scrutiny; despite commissioner Bright repeatedly assuring them he is reporting all decisions to them. It appears the commissioner has also taken out a “Barclaycard” and taxpayers are paying the bill. Payments listed are for £158.34, £113.17, £106.75, £5.52, £43.80, £90, £102.00 and £47.65. A Freedom of Information request would be required to obtain the individual transactions on the statements. The commissioner has also billed the taxpayer 20p for “2 teas”; one for him and one for his Chief Executive; this is described as “internal hospitality”. The commissioner has clarified that his salary and that of the deputy is included [bizarrely] under “support staff”. A year’s worth of salaries, national insurance and expenses for the commissioner and deputy is, as broken down above, £117,000. Two months off the deputy’s given he wasn’t appointed for November and December 2012 reduces this by £5,000 to £112,000. The commissioner’s office costs are £147,812 (24%) higher than the Police Authority and overall the commissioner is costing more than the Police Authority did too. I can’t believe this, please continue to investigate and inform those of us who aren’t aware of these scandalous excesses ~ needs monitoring closely and full justification. The BBC Cambridgeshire Breakfast show with Paul Stainton on the 10th of December 2013 reported Police and Crime Commissioner Graham Bright’s spending on his office in his first year. Paul Stainton Now it was a role that was created with two main goals: Making the leadership of our police forces more accountable and cutting costs but figures released by the Police and Crime Commissioner for Cambridgeshire show he’s failing in at least one of those two areas. In his first year in the job Sir Graham Bright’s office cost eight hundred and eighty five thousand pounds to run; now in its last year of operation the Police Authority the body which he replaced cost nearly fifty thousand pounds less. Here’s Dotty McLeod. Dotty McLeod Sir Graham Bright was appointed as Cambridgeshire’s first ever Police and Crime Commissioner in November 2012; he claimed he’d be costing taxpayers around five or ten percent less than the Police Authority but figures released recently suggest that’s not been the case. In its final full year of operation the Police Authority’s budget was nine-hundred and seventy thousand pounds but they actually spent considerably less than that with their costs coming to eight hundred and thirty nine thousand pounds. Compare that to the office of the PCC; in the year from the twenty second of November last year they estimate they spent more than that, just over eight hundred and fifty five thousand pounds. Their costs include Sir Graham Bright’s own salary of seventy thousand, his deputy’s salary of twenty eight thousand, corporate subscriptions costing nearly thirty five thousand and paying just over forty-one thousand pounds to agency staff. Paul Stainton Well it was announced yesterday that an agreement between Police Commissioners in Bedfordshire and Hertfordshire and Cambridgeshire will see the three forces share some back office services; now some of the services which will be shared include finance, legal, ICT, firearms licensing and custody and crime recording. It’s unclear though how much money the agreement will save. We were hoping to ask the Police and Crime Commissioner Sir Graham Bright this morning and also hold him to account over the fact his office cost more when he promised it would cost less. Unfortunately our most recent request for an interview has regrettably been turned down. However we can speak to Ed Murphy who stood as Labour’s candidate for the Police and Crime Commissioner when the role was created in November 2012. Ed, Good Morning. Paul Stainton What do you make of it all? Ed Murphy Well he’s failed miserably. He’s not accountable. You can’t get him on BBC Cambridgeshire very easily and he’s overspent his budget. I’ve been looking at the figures Richard Taylor produced; he’s spent a hundred and fifty thousand pounds more on his office costs than the previous police authority did. Paul Stainton Well can you explain that because according to our figures he’s only spent fifty thousand pounds more. Ed Murphy You’ve got the total cost, including his expenses which have gone up from eight hundred and thirty five thousand to eight hundred and eighty five thousand, but the office costs have gone up from six hundred and twenty three thousand to seven hundred and seventy three thousand. There’s also other expenditure that’s not in yet. Possibly the office in Cambourne because he’s refused to use the offices at Police Headquarters. We’ve also got a Policing Panel as well on there which has been established; not terribly expensive but tens of thousands of pounds and the secretariat for that and of course we have to pay for these elections which cost millions of pounds. So it’s very very expensive. He’s not reduced his budget, he’s increased his own budget. He’s paid himself seventy five thousand pounds and some buddies that he’s employed as well. If you go on the website they are advertising for a director of communications and public engagement through Reeds, salary negotiable, and he’s also advertising for a Chief Force Office, these could be amalgamated, Cambridgeshire is a small force we could be working with other police services for these functions to be carried out far more cheaply. As far as accountability goes in the North of the County many people in the police service and elsewhere say they’ve never seen the commissioner. Paul Stainton If he was on this show and I wish he was but he’s not, I’ll try and defend him though. If he was on this show he would say he already has saved millions of pounds. He’s sharing services, that was announced yesterday and PCCs from Bedfordshire, Cambridgeshire and Hertfordshire have signed a memorandum of understanding, back office services have been shared, he claims to have saved millions. Ed Murphy What’s happening is the police service is facing very large cuts, twenty percent over five years, yet he’s increasing his budget. It’s a bit like the MPs taking eleven percent plus when everyone else is getting nothing. The police service would have become more efficient and effective in spite of Graham Bright, not because of him. Paul Stainton What would you have done differently if you had done the job? Ed Murphy I wouldn’t have taken seventy five thousand pounds of salary; I wouldn’t have been going in a few hours a week; I would have been ensuring we didn’t employ our buddies, I would have shared chief officers with other police services, and I would have used those savings to provide crime prevention projects in Cambridgeshire and probably saved enough money to employ additional police officers as well. I’m ultimately responsible for a budget of one hundred and thirty million. My role and that of the former Police Authority are not comparable, I have a much broader range of responsibilities and duties, we face significant financial challenges in Cambridgeshire and I am overseeing huge changes that are delivering millions of pounds worth of savings already this year. We’ve saved £3.7 million pounds and that’s what matters. So he claims he’s saved £3.7m pounds Ed? Ed Murphy Yeah, well he’s not done that the Police Service force executive have done that. Paul Stainton What do you think. If you were summing up Sir Graham Bright’s performance in his first year, what would you write on his report? Ed Murphy I don’t want to disparage an individual. I do find him very amusing. I’m not sure he’s really committed to the job and the whole idea of Police Commissioners was flawed from the beginning. To have an election in November where only fifteen percent of people voted really wasn’t a good idea. Paul Stainton Could do better? Ed Murphy Could do a lot better. Very very poor. Paul Stainton That’s Ed Murphy. Councillor Ed Murphy from Peterborough who stood as the Police and Crime Commissioner candidate when the role was created in November 2012. Your thoughts on that this morning 08459…. By Drivetime Police and Crime Commissioner Graham Bright succumbed to the pressure to defend his broken promise and excess spending on his office and appeared on the Chris Mann show on BBC Radio Cambridgeshire. Chris Mann : Since you’re so interested in efficiency what about the new figures that appear to show your regime as PCC is costing more than the old system of having a committee. Why is it costing so much Sir Graham? Graham Bright : My new regime is very different to the old one and there’s a lot more responsibilities certainly joining up with the other forces lots of negotiations the fact that I’m going to have to look after all of victim support in future, that’s coming our way. The fact we’re going to sort of try to work on blue life it’s a very different operation. And we’re only talking about, in the argument that’s going on, we’re actually one hundred thousand below budget. Now I know what’s been happening. Someone’s been playing silly beggars and looking backwards. We’re still a hundred thousand below our budget. But the big thing that matters is already we have saved seven million pounds, so lets be grown up about it, if we’re talking about thirty or forty thousand pounds it is nothing compared with what we’re saving and putting back into the community. Chris Mann : You’re not objecting to accountability are you? Graham Bright : Not at all. Not at all no. Chris Mann : There should be transparency and people should be able to look at this shouldn’t they? Graham Bright : You’ve got to be sensible about it. What are we doing? There is a change. I’m not only the Police Commissioner I’m also the Crime Commissioner and that’s concentrating on trying to reduce crime so cannot compare what I’m doing with the old Police Authority. No way. Chris Mann : You’re still value for money are you? Graham Bright : I’m value for money, of course I am. Chris Mann : Sir Graham Bright, Police and Crime Commissioner for Cambridgeshire thank you very much for joining us. Graham Bright : Thank you. What on earth does Graham Bright mean when he says he’s “One hundred thousand below budget”? What does he mean when he says he’s going to “sort of try to work on blue life”? Graham Bright is wrong to suggest collaborations between forces is something which was not considered under the Police Authority; the current collaboration between Bedfordshire, Hertfordshire and Cambridgeshire started under the Police Authority. As Graham Bright notes his responsibility for Victim Support is something to come in the future; so it isn’t something he can use to justify his higher office costs. The commissioner also told Chris Mann that everything other than local policing (and Chief Constables and Police and Crime Commissioners) had been shared between Cambridgeshire, Bedfordshire and Hertfordshire. My view is if the three forces have effectively merged then we have ended up with two many Chiefs and Commissioners and ought to cut down the top level too. If Police and Crime Commissioner Bright sees himself as being £100K below budget that presumably explains why he’s still relentlessly expanding his office, employing more and more people. The meeting papers for the police and crime panel meeting on the 5th Febuary have been published today. These include for the first time publication of the proposed accounts and precept for the coming financial year. In the documentation he mentions that despite 5k tweets relating to the increased precept they only received 2 items of correspondence with regards to this in December. At the time I searched online for the proposed budget and could not find it. Given this no wonder no feedback to his office. From a very swift perusaI I guess the headlines are the announced 1.97% increase in the precept (or as Sir Graham preferred a 7p per week increase), the reduction in the police grant by £3.7m, the increase in the PCC office costs to £1.2m, the savings in the police budget of £3.4m, and the reduction in the police workforce by 51 (including 30 PCO’s). The politics of the budget are the avoidance of a referendum on the increased precept by putting the increase at 0.03% below the point where a referedum is triggered (this is explicit in the documentation), the continued claim that the budget for the PCC office for the current financial year represented an 11% saving over the police authority, the transfer of victim support to the responsibility of the office of the PCC (represented by £300k increase in the office costs), clarity on the reporting structures for shared constabulary resources and responsibility for savings, the reduction of PCO’s and therefore frontline patrols, and the legitimacy of the PCC’s plan from his claims about feedback mechanisms including attendance at neighbourhood watch AGM’s (none listed in recent publication of Sir Grahams diary. Oh and finally the accounts being prepared by Niki Howard who is described as the Cheif Financial Officer although this post would appear to be vacant according to the PCC website! My view the budget will be nodded through by the panel based on previous form where limited questions are asked or answered. I used the public participation agenda item at the Police and Crime Panel to suggest the panel use the spending information released as the basis to question the commissioner on his first year spending. The oversight of the PCC finances are unbelievably poor. Sir Graham has been able to get away with claiming that he has saved money in his office by comparing a budget with a previous budget, and with no reference to actual known expenditure. That the crime panel buys this is scandalous. The panel is just not fit for purpose. Cambridgeshire’s Police and Crime Commissioner’s Office is the most expensive, per person, in the country at £2,979 per thousand per year. Cambridgeshire’s Police and Crime Commissioner’s Office is costing £951,000 more per year than Cambridgeshire’s Police Authority cost, the second highest increase in the country. Cambridgeshire’s Police and Crime Commissioner has issued a statement (snapshot 2015-08-11 00:30) claiming the Taxpayers’ Alliance’s report is incorrect, he also claims to have costed less than the Police Authority did. The Police and Crime Commissioner’s statement is highly misleading. He is claiming that because he was holding £163,000 of undistributed grant funds we should subtract that from the costs of his office. The fact he was holding cash he hadn’t distributed is utterly irrelevant to any assessment of his spending on his office. 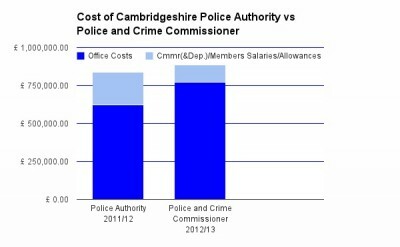 The Police and Crime Commissioner took the Cambridgeshire Police Authority expenditure for 2010/11 as £836,000 (including members’ allowances and expenses). The Police and Crime Commissioner didn’t provide a reference for that figure but it can be found In the 2011/12 statement of accounts. The members’ allowances and expenses for 2010/11 were £210,655 – these are not office costs so should be subtracted giving the 2010/11 Police Authority Office Costs of £625,345. The Police and Crime Commissioners’ 2013/14 accounts show, on p57, a total expenditure of £1,787,000 of which £1,060,000 was grants rather than office costs, and £109,000 for the commissioner, and his friend Brian‘s, salary and expenses. The remainder is office costs of £618,000. The Police and Crime Commissioner’s Office was, in that year, cheaper. The year before though, in 2012/13 he paid £90,000 more out in staff costs and had significantly higher office running costs and professional fees so the comparable figure was £835,000. Quite why the taxpayers alliance, and the Police and Crime Commissioner didn’t use the 2011/12 figure (which was just £3,000 greater) for comparison isn’t clear given that financial year ended in April 2012, a clear six months before the introduction of Police and Crime Commissioners. The final line is calculated the Police and Crime Commissioner’s 2014-15 statement of accounts which shows £6,937,000 of expenditure, of which £5,912,000 was for grants,and £109,000 for the commissioner, and his friend Brian‘s, salary and expenses. I have considered the £6,000 spent on the Police and Crime Commissioner’s pet “cadets” project to be part of his office costs. The latest accounts are very confusing, the Commissioner has for example listed his office staff as “police staff”. The latest accounts from Cambridgeshire’s Police and Crime Commissioner show his office is costing £922,000 compared with the £623,000 the Police Authority cost in its last year of operation. That’s an absolute increase of £299,000 and a percentage increase of 48%. In terms of per person efficiency, £922,000 assuming the a 900,000 population, that’s £1024.40 per thousand people per year. The Taxpayer’s alliance in their press release said they had produced a per resident figure, but the detailed PDF headed it a per thousand 2012 electors figure, using the 599,894 electorate figure gives an office cost for 2014-15 of £1,537 per thousand electors. For an even simpler comparison lets just take the staff costs (not including costs of either Police Authority members or the Police and Crime Commissioner and his friend who replaced them. The latter figure includes £10,000 of non-operational consultants. The Police and Crime Commissioner’s current office staffing budget is 177% (2.7 times) higher than the amount the Police Authority spent in its final full year of operation. The Cambridge News have published an article: Police boss Sir Graham Bright denies he’s ‘worst value’ crime commissioner as office costs spiral. One of the most shocking aspects of this latest escapade has been the Police and Crime Commissioner suggesting holding undistributed grants reduces the cost of his office. This isn’t noted in the article. The latest rise in the Police and Crime Commissioner’s office costs should not have come as a surprise to the Police and Crime Panel as they were included in budgets they have had the opportunity to scrutinise and make recommendations on. The panel has not taken the opportunity to recommend the Police and Crime Commissioner reduces his office costs. The rise in office costs is contrary to Graham Bright’s pre-election promise to cost less than the Police Authority did. The Police Authority spent £347,000 on staff, the Police and Crime Commissioner is currently budgeting £962,700 which is 177% or 2.7 times more. The article notes the recent large hike in office costs. The comparison with the costs of the Police Authority which the Police and Crime Commissioner replaced is even more stark. While some of the staff may be involved in administrating the ~£6m of grants the Police and Crime Commissioner distributes he also has two public relations staff, two outreach officers to whom he delegates core aspects of his role, and employs public relations and marketing consultants. The spending on public relations is especially concerning in the run-up to an election in which the Police and Crime Commissioner may seek re-election. I think a Police and Crime Commissioner should be doing their own “outreach”, attending public council meetings themselves and not employing a representative to send. I can see a need for assistance dealing with correspondence and casework but cannot see any justification for such a large and expensive publicly funded office. To reference the points made I included a link to this page.